I will exit this category immediately, if I am in any way offended by the sexual nature of the items listed for sale. The film's main characters are a reactionary bathhouse owner, whose boyfriend studies theology and sings in a Bach-Choir; a therapist who teaches death meditation and gymnastics to AIDS patients; a female reporter, who's disguised herself as a man and is spying on the gay scene and the AIDS-afflicted; a certain Dr. Blood, who snares the HIV virus in Africa; a minister, who makes false promises; as well as rich queens and revolutionary gay men. 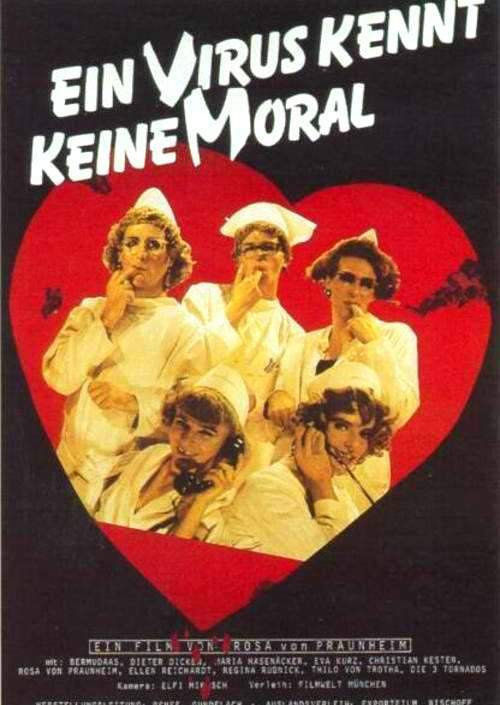 This is the first German film which covered the subject of HIV and AIDS. It's a black, satiric comedy, whose protagonists make up the homosexual and transvestite scenes in Berlin and who mirror the first phases of the AIDS panic to strike Germany. It's the film's intention to address the topic of AIDS in a rather gaudy and macabre fashion. At a bleak tea dance for effeminate men, the gay band "Bermuda" sings, "Hurray, we're still alive!" In the end, everyone has AIDS and nurses roll the dice to bet which person will die first. The government rounds up and deports all the infected to sealed-off concentration camps on Hell-Gay-Land Island. Definitely a work of black humor meant to provoke the viewer. Ein reaktionärer Saunabesitzer, dessen Freund Theologie studiert und Bach-Chöre singt, eine Therapeutin, die Aidskranke Todesmeditation und -gymnastik lehrt, eine Reporterin, die sich als Mann verkleidet und die Gay- und Aids-Szene ausspioniert, eine Frau Professor Doktor Blut, die sich das Virus in Afrika einfängt, ein Minister mit falschen Versprechungen, reiche Tunten und schwule Revolutionäre sind die Hauptcharaktere des Films. Der erste deutsche Spielfilm über Aids. Eine schwarze Komödie, deren Hauptdarsteller die Homosexuellen und Transvestiten Berlins sind und der auf satirische Weise die ersten Phasen der Panik nachzeichnet. Der Film will das Thema Aids mit grellen Einfällen und einem makabren Rundumschlag einkreisen. Auf einem trostlosen Tuntenball singt die Schwulenband Bermudas »Hurra, wir leben noch.« Am Ende haben alle Personen Aids und die Nachtschwestern würfeln, wer als erster sterben wird. Die Regierung schickt alle Infizierten ins geschlossene Lager auf die Insel Hell-Gay-Land. Schwarzer Humor als Akt wütender Provokation. DVD-R IS IN GERMAN WITH HARD-ENCODED ENGLISH SUBTITLES. Approx. 85 mins. See sample for film quality!